Prince Frederick, Maryland: Recorded Books, 1991. This is the unabridged version of The Dark Wind on audiobook, narrated by George Guidall, published by Recorded Books in Maryland in 1991. The book is recorded on six audio cassettes for a total listening time of 8 hours. The cassettes are in a black plastic case with cover illustration by David Shannon. 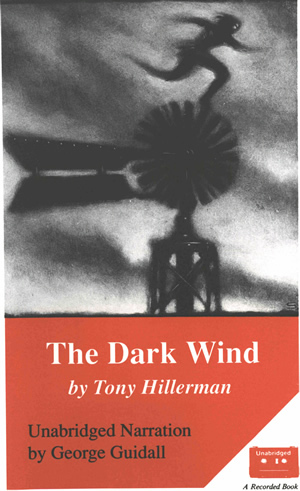 The illustration, in shades of black and white, shows an old-fashioned farm windmill against a cloudy sky. Above the windmill is a running figure; it is not clear if the figure is real or made of clouds, or whether it is running across the top of the windmill or riding on the wind. Below the illustration, the book title and author are printed in white on red, with the narrator credit below. On the back of the case is a synopsis of the novel, a long quote praising Hillerman's work from the New Republic, publication information and a list of other available Hillerman titles. On the spine of the case, the book title and author name are printed horizontally in red on white, below the publisher's logo and item number printed vertically in black.